With the Air Scrubber Plus, you can remove up to 99.9% of the harmful contaminants in your home! Did you know that most germs, bacteria and viruses are transmitted by touching surfaces? Or that contaminants from school, daycare, or the office follow us home and land on our doorknobs, counter tops and floors? 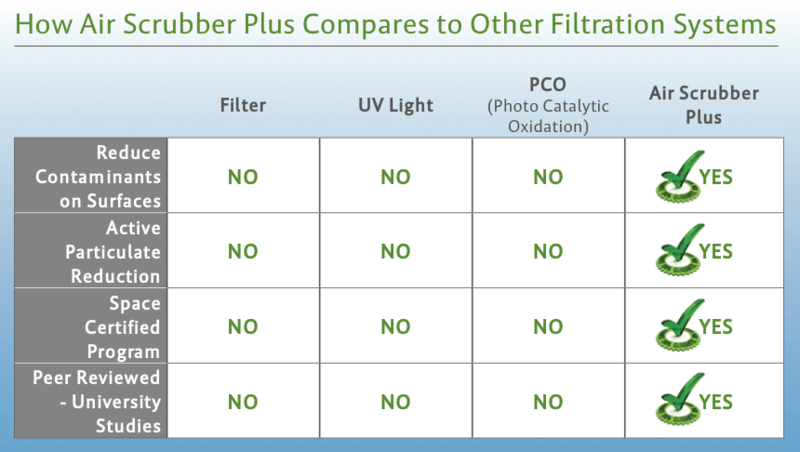 Air Scrubber Plus® with ActivePure™ technology actively sends scrubbers into the environment to reduce contaminants on surfaces as well as airborne pollutants. In addition to removing airborne contaminants, ActivePure™ technology is also highly effective on gases, vapors, VOCs and odors.